THE countdown is officially on to the next instalment of The Surrey Half Marathon after race organisers launched the popular event with the help of Woking dignitaries. Woking MP Jonathan Lord and Mayor Derek McCrum joined local runners, charity representatives and race organisers at the Leisure Centre last Thursday to celebrate the milestone ahead of the action on March 13 next year. The Surrey Half Marathon is the biggest event of its kind in the county, and its entrants take in a 13.1-mile loop from Woking to Guildford and back again. Each runner will pick up a medal for their efforts, with many already signed up to support local charity groups while putting their best foot forward. A total of 10 per cent of entry fees will go directly to Shooting Star Chase, a leading children’s charity based in Addlestone. But it is not just Shooting Star who will benefit. Macmillan Cancer Support have been chosen as the event’s National Charity Partner, and chiefs are urging all runners to lend their backing to a worthy cause. the team to make sure the half marathon is a huge success,” said Riona Doidge, Regional Challenge Events Programme Manager. A Kids’ Sport Challenge (for six to 16-year-olds) will also be run in tandem, and tests youngsters’ physical capabilities in the build up to a 2km run on the same day as the senior competition. Meanwhile, local businesses are invited to compete for kudos on the streets by participating in the Corporate Challenge in teams of three. Surrey Half is being sponsored by athletic garment supplier 2XU, whose Sales & Marketing Manager, Mike Martin, said: “Running is a growing part of our business so we are delighted to be partnering the race. installment of the event. Mr Jenkins said: “The 2XU Surrey Half Marathon brings together so much of the community and local businesses and charities in its delivery. Details of road closures set to be enforced on the day will be announced in due course. 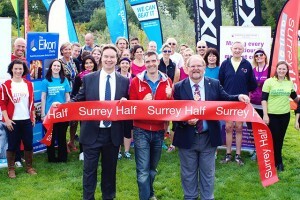 To find out more about the big day, simply go online to surreyhalfmarathon.co.uk.